Mind Maps are a powerful tool for generating ideas. Bubbl.us allows to create mind maps in a web-based tool for free, and to let students work together to co-create mind maps in groups. Bubbl.us can be used without registering as a user. 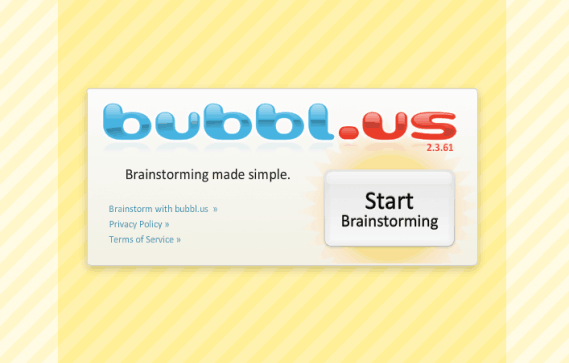 Bubbl.us suitable for use within the dialogical form of teaching. Within the dialogical form of teaching it is obvious to use Bubbl.us as students' individual mind maps, for example to help them generate ideas prior to writing assignments and other tasks. The student may write his ideas into the mind map, and the teacher has the opportunity to read and advise the student from his/her own starting point. The mind map can function as a mean to continuously control the process, and keep the student focused on what was, the initial idea. It is always possible to export mind maps as a .jpg or .png image. If you need help getting started with Bubbl.us in teaching and to use the functions of the tool, You can click on ' Help ' in the top right-hand corner of the this page.